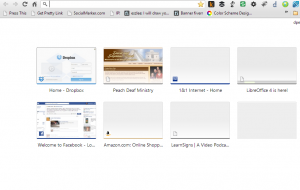 I had never personally seen the need to remove any of the thumbnails from the “most visited” screen on Google Chrome. However, one of the ladies in my office was concerned about having her Gmail inbox showing up as one of the thumbnails. The text is too small and you can’t really read anything even if you magnify the browser; but, I think it is a legitimate concern. This isn’t a problem for those sites you visit once or twice and don’t want people knowing about. Those won’t likely show up on your most visited page anyway. Deleting one of the thumbnails from the most visited page wasn’t as straighforward as one would think. It is also not clear what happens after the thumbnail is deleted. I am currently on Chrome version 24.0.x. The process has changed from some of the instructional websites that I read for older versions of Chrome. In this current version you hover your mouse over the thumbnail. After a second, a very light X will appear in the top right-had corner of the thumbnail. When you hover directly over the X it will darken and you can click it to eliminate the thumbnail image. You can click a thumbnail and drag it to a “Remove From Chrome” box that shows up at the bottom right-hand corner of the page when you start dragging the thumbnail towards it. For a few seconds after deleting a thumbnail (with either method) a line will appear at the top left of the most visited page which says, “Thumbnail Removed. Undo Restore all X.” Those give you a chance to undo the last thumbnail deleted or restore all the previously deleted thumbnails. Or, you can click the X to get rid of the message quickly. Doing this (either either method) will remove the thumbnail from the list and pop up another in its place. I am not sure how it chooses what to put in that spot since all the other thumbnails do not shift to fill the gap. It seems that once you do this, then that item won’t show up again on your most visited page. Therefore, if you want something to show up on the page, but not in the position it is in, then don’t delete it. It won’t come back. You just have to keep visiting that page for the item to move further to the front of the most visited position. What idiot at Google thought of putting all of these ugly thumbnails on the Google home page? Why did they have to fix something that wasn’t broken? Google, just be a search engine, and leave it at that – even improve youre lousy chrome browser, which always crashes on me even. This option is useless as any deleted thumbnails are simply replaced by another. What is required is FOR NO thumbnails to display. This is what users have been requesting for years but there is still no answer on how to achieve this. Until then I for one am sticking with Firefox. I like to delete because I couldn’t see my apps.